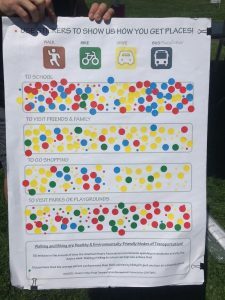 The transportation-related activity had students placing stickers to indicate whether they walk, bike, drive, or take the bus to get to school, visit friends/family, visit park/playgrounds, and go shopping. The informal survey had over 150 responses, which we tallied to develop a table of trips by mode (see chart below). We compared the distribution to last year’s results and found the overall tally for each mode was within 3-5% of last year’s values, which provides some legitimacy to the exercise. 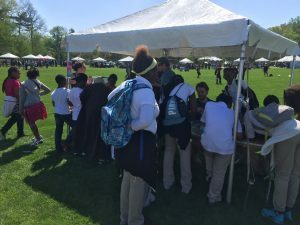 However, we also heard from kids that they would have liked options for trains, subways, and carpooling – an item we will address for next year. The second activity focused on land use and development. Using an enlarged aerial map of the Ambler Campus, students were shown where on the map they would be standing. 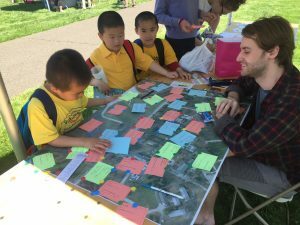 Our volunteers then asked what kind of land uses they would consider adding to the immediate area. The most common uses kids identified were park space, sports fields, basketball courts, and a pool. Other less common responses included a water park, grocery store, hospital, food shelters, homeless shelters, (free) ice cream places, and even a hotel. 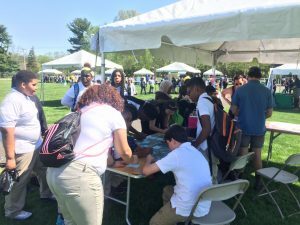 Each year, Temple’s Earthfest gives planners an opportunity to engage local students in a light-hearted, yet meaningful dialogue about the important work we do every day. Thanks to the efforts of Ashley Nuckles, Tim O’Leary, Kyle Hearing, Ted Mullen, and John Federico, APA PA SE was able to stay involved with this great event.